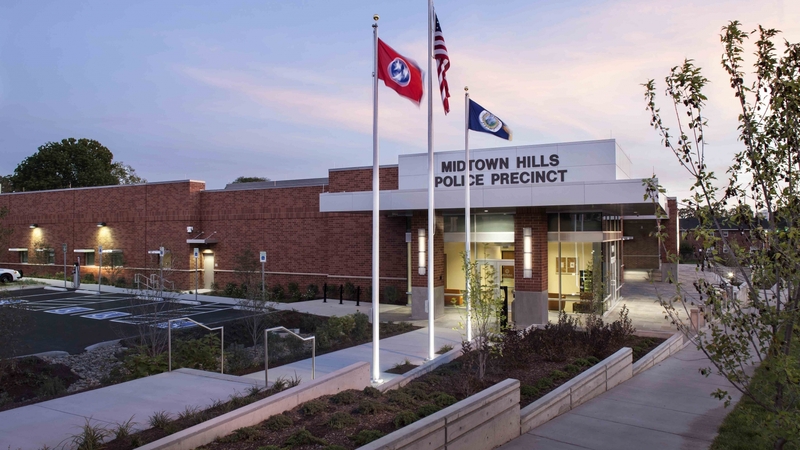 The Midtown Hills Police Precinct for the Metropolitan Nashville Police Department (MNPD) is a new 21,722 SF building located between the Gulch and the 12th South neighborhoods. Design elements for this project were influenced by these two distinct areas and incorporated to bring visual connection and relationship to the surrounding urban condition. The one story structure includes patrol, shift and detective offices, exercise and locker rooms for police personnel, and a Community Room that can host a variety of public meetings and events. An informal community amphitheater is located at the low end of the site, counterbalancing the surrounding urban hardscape. Along the east elevation of the site, a monumental stair element adjacent to the Community Room enhances the civic presence of the building. The layout allows for natural light at the regularly occupied spaces, enhancing the employee work environment. Open, inviting terraces on the North, East and South sides of the building. Sustainable design features include drought resistant landscaping, efficient, water saving fixtures, regional and recycled building materials, low VOC materials. Innovation and Design strategies include Exemplary Performance for maximizing open space of the site and integrating a Green Housekeeping plan. Sustainable Site features include the selection of a site in an urban area with community connectivity, access to public transportation, bicycle storage, a public car charging station and a reflective white roof to reduce the heat island effect and help cool the building.